AdWords is Google’s pay-per-click advertising program. You pay if, and only if, web surfers click on your ads. Many people think of SEO and AdWords as in opposition to each other, whereas in fact the two can (and should) work together. In this Google AdWords Class, we give a basic AdWords training in how to take proven SEO techniques and weave them into your Google AdWords advertising. Your AdWords advertising is thus more effective in its own right, plus works hand-in-glove with your SEO strategy. “As it should be,” a savvy marketer might say! Ready to sign up? Click here for discounts on packages, or call +1-510-894-6791. Oops! This course is not currently offered. We recommend, instead, that you buy Jason’s AdWords Workbook. Vs. or And? Is it AdWords “versus” SEO, or AdWords “and” SEO? Blending the two together in an efficient integrated marketing strategy. AdWords Special Advantages. AdWords has certain unique advantages over SEO, among them geotargeting. When and where AdWords especially shines. AdWords Special Needs. Unlike SEO, you pay for each and very click. So there are some special situations and concerns with respect to AdWords, especially “negative” keywords. AdWords Rank. Using special tools to monitor your rank by Google keyword/keyphrase and blending this data into your AdWords campaign to save you money. AdWords Bids. Understanding Quality Score and the AdWords bidding process. AdWords On Page Optimization. Creating effective AdWords campaigns from the beginning. AdWords Landing Page Optimization. Creating effective AdWords landing pages. 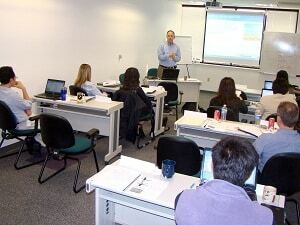 Many students come to us looking for a face-to-face AdWords class experience. For groups of three or more, we do provide that service – simply email us for a quote. However, for most people especially in big cities such as Los Angeles, Houston, Chicago or even New York City, an online training experience can be very competitive. Why? Google AdWords is essentially an online experience in the cloud, and so during and AdWords or PPC (Pay-per-click) class the student and the instructor spend 100% of their time online. This can be done easily in a live AdWords class. So while many students start their search for AdWords training looking for a New York AdWords class or an AdWords class in Chicago, they realize that our online experience is superior. Getting the video recordings is just icing on the cake!